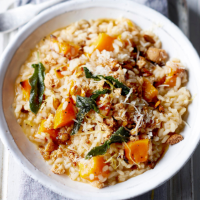 You can use pumpkin or butternut squash in this recipe. The biscuits may seem a bit offbeat, but it’s a traditional pairing that adds a delicious twist. 1. Preheat the oven to 200˚C, gas mark 6. On a large baking tray, toss the pumpkin with ½ tbsp oil; season. Spread in a layer and roast for 45 minutes, turning halfway; set aside. 2. Meanwhile, heat the remaining ½ tbsp oil and 10g butter in a large pan and fry the onion and garlic over a medium heat for 10 minutes. Stir in the rice, turn up the heat slightly, then add the wine, if using, and bubble until absorbed. Bring the stock to a simmer in a saucepan with 250ml water. 3. Add a ladleful of hot stock; simmer and stir until all the liquid is absorbed. Repeat, adding a ladleful of stock at a time, until the rice is tender with just a little bite, about 20 minutes. Stir through the roasted pumpkin and cheese; season. 4. Heat the remaining 20g butter in a pan and, once foaming, add the sage. Fry for 2-3 minutes, until the sage is crisp and the butter is nut brown. Add the lemon zest and juice. 5. Spoon the risotto into bowls and drizzle with the sage leaf butter. Scatter over the crushed amaretti, and more parmigiano reggiano, if liked.